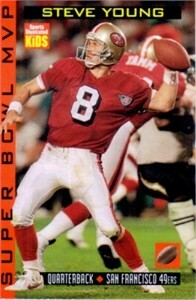 Sports Illustrated for Kids Super Bowl MVP card of former San Francisco 49ers superstar quarterback Steve Young. Slightly oversized, with typical perforations. ONLY ONE AVAILABLE FOR SALE.